First and foremost, I’m a New York Mets fan, have been for over 40 years and always will be. That said I’m also a resident of St. Louis who attends about 50 Cardinals games per year since, quite simply, it’s the only big league baseball in town. Today marks the first home playoff game for the Redbirds since the elimination game against the Dodgers in 2009 (which I also attended). As such I have been able to procure tickets to both games 3 (today) and 4 (tomorrow) of the National League Division Series against the Phillies. Normally when I attend Cards games I proudly sport attire that represents my Mets along with something emblematic of the home town Cards that I’ve either been given or somehow accumulated over the 20 years we’ve lived here. Today will be no different although maybe not so evident. I’ll certainly have my Mets cooler bag with my cold drinks inside along with my netbook computer adorned with decals representing MLB and both the Mets and Cards. Today I’ve decided to be a “bandwagon” joiner and will partially cover up my Mets loyalty by wearing a Cardinals red t-shirt over my Mets t-shirt. I’ll also sport a Redbirds cap. I may even attend the pregame Cardinals’ rally downtown before today’s game. Some Mets fans may question my loyalty which, as some folks who know me understand can never be put into any sort of uncertainty. This posturing by me is simply part of what we all should strive for. The economic impact of post season baseball in St. Louis will be felt for some time with the influx of millions of dollars into the dying downtown area of this midsized Midwest City. The hotels are all nearly at full capacity and people in general feel better about the city and themselves. Putting people to work is nothing if not a "Good Thing". If my supporting the home town team in a playoff run that will provide a greatly needed economic stimulus to help support thousands if not more, in this market can be viewed as something other than doing what’s right and for the “greater good” then so be it. But to question my loyalty would not only be absurd but outright blaspheme. It sure doesn't hurt that he Cards face one the Mets most bitter and hated rivals in the Phils. 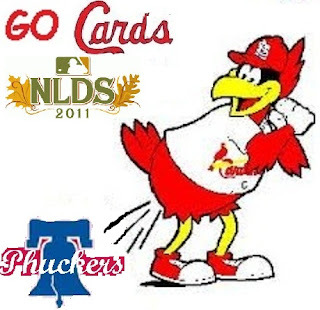 Time to get down off my high horse and do a little soap box rallying so, as always “Let’s Go Mets” (that phrase is never out of season) and for the “GREATER GOOD” Go St. Louis Cardinals and our city.